A well-illustrated website. The Galerie is full of stunning photographs. Texts are in German only. The Andre Chastell Centre specialises in French art history, including stained glass. The Glass team produces CVMA volumes and is led by Dr Claudine Lautier. The site contains images of stained glass. A short guide to the members and activities of the CVMA [USA]. These links are to museums which contain significant amounts of medieval, and later, stained glass in their collections. The websites for The Stained Glass Museum and for the Victoria & Albert Museum include a range of images of stained glass. The Hungate Medieval Art Centre in Norwich focuses on stained glass on East Anglia. The home page of Scotland’s national galleries. The National Gallery of Scotland itself houses the vidimus that features on the home page of Vidimus. The following links are to major international museums with stained glass in their collections. Those websites that include a particular focus on the museum’s stained glass, or a range of its images, are noted. Housed in a disused medieval church this Museum specialises in the art of the Middle Ages. Its web site includes good images of stained glass. The site has pages in English. Site of the German stained glass museum, devoted to stained glass from the middle ages to the present day. Although the site has an English version, this was not functioning when the first issue of Vidimus was released. This New York museum specialises in art from the Middle Ages. The website includes images of stained glass. It is a branch museum of the Metropolitan Museum of Art. The Museum of the Middle Ages in Paris is housed in the former Parisian Mansion of the Abbots of Cluny. Exhibits include a important collection of stained glass, some of which can be viewed on the museum website. The site has pages in English. This museum has an important collection of medieval stained glass. Selected examples from its collection can now be viewed on-line. The following links are to major stained glass monuments in the UK. Those websites which include a particular focus on the building’s stained glass, or a range of images, are noted. A discussion of the cathedral’s stained glass, and the cathedral studios, can be found under ‘History and Heritage’. Information about, and images of, many of the church’s late medieval windows is presented in the section entitled ‘About our church’, under ‘Stained Glass’. The ASGG is the leading organisation for stained glass artists and conservators in the USA. This website contains more than 2,000 images of stained glass in Canada. The Society of Glass Technology encourages the study of the history, art, science, design, manufacture, after treatment, distribution and end use of glass of any and every kind. The Churches Conservation Trust cares for over 340 historic churches, including some with excellent medieval glass. Good examples include St Mary’s church, Shrewsbury and St George’s, Edworth, Bedfordshire. Visit this site to learn more and to support the Trust. Selected images of Austrian stained glass appear on this site. To find the images of stained glass, use the left hand menu bar, click on ‘Details’ and go the bottom of the page until you find Glasfenster. Monica & Cliff Robinson have created an invaluable site containing details of over 1,000 stained glass windows in Buckinghamshire. The site includes about 2,000 photographs. This link leads directly to the stained glass aspect of California State University’s well illustrated World Art Site and includes a large gallery of images. A web site with excellent images of stained glass windows from Bourges, Les Mans, Poitiers and Chartres. Information and images relating to medieval stained glass from Esslingen am Neckar (Germany). This famous picture archive includes many images of stained glass. The website is in German. Gordon Plumb is one of England’s leading photographers of stained glass. He has contributed images to both the main CVMA site and to Vidimus. Stained glass is represented among the several hundred thousand items. Painton Cowen’s new website with 10,000 images of French and English stained glass. The Michigan Stained Glass Census census is run by the Michigan State University Museum. It includes an impressive photo archive as well as lots of information about American stained glass artists. An expanding web site with high quality images of medieval – and later – stained glass from Norfolk. This site is dedicated to the discussion and illustration of medieval rose windows. A 2,000 picture archive about this famous cathedral, including images of stained glass. A dazzling photographic website created by the CVMA [Potsdam] of the stained glass in this former abbey. For information about the site visit: Vidimus 28, April 2009. The 16th-century windows in St John’s church [ Sint Janskerk] in Gouda are the finest examples of surviving early glass in Holland. 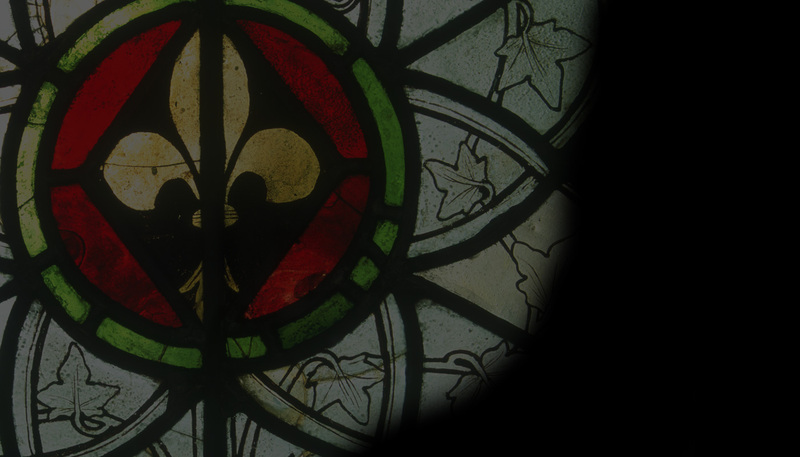 Two websites provide excellent guides to the church and its famous glass. CVMA author, Professor Virginia Raguin has created a helful teaching aide resource with selected images from her book, Stained Glass from its Origins to the Present, New York: Abrams, 2003. Mary Ann Sullivan, Professor Emerita of English and Art History at Bluffton University Ohio, has created a website with 16,000 images which include architecture, sculpture and much else of interest to Vidimus readers. A searchable, digital archive of British and Irish Romanesque sculpture. A USA-based, free, online academic magazine specialising in new approaches to medieval art, including stained glass. French site with a vast range of information on stained glass. Project by Lambeth Palace Library to digitize and provide access to church plans held in the Incorporated Church Building Society archive. The database, searchable by place, people or date, contains plans of many churches featured in the CVMA picture archive. A comprehensive website maintained by Dr Alison Stones of the University of Pittsburg with information about the architecture and stained glass of Chartres cathedral. Published by the International Society for the Study of Pilgrimage Art.